Stevensville Boaters, we’re coming to you! 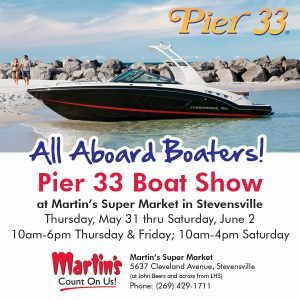 Stop by the Pier 33 display at Martin’s Supermarket in Stevensville, Thursday May 31 thru Saturday June 2. Visit with our staff, learn how much fun boating can be and sign up for Pier 33’s Ride & Decide Demo Days!